Increase the height of your pillow. In other words, keep your head and shoulders at a higher level so that the acid from the stomach doesn't flow back into your food pipe. Avoid caffeine at night - chocolates, coffee, etc can trigger acid secretion. Do not exercise vigorously before bedtime. A leisurely stroll is fine. Leave at least 2 hours gap after dinner and before bedtime so that the stomach contents are emptied out. Keep your dinner light. Avoid heavy, spicy and fatty meals at night. Maintain a healthy weight. Obesity increases the chances of heartburn. Go easy on alcohol. Avoid a nightcap because alcohol can trigger heartburn. If you're a smoker, quit now! Wear loose-fitting clothes when you go to sleep. Check with your doctor on how best to control heartburn and on what medications (if required) would suit you best. 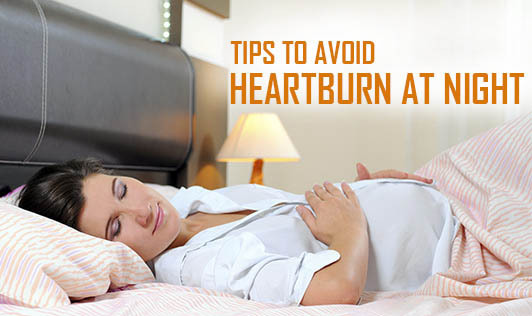 If you can prevent your heartburn problem from disturbing your sleep, you'll wake up much more refreshed the next morning.